GIVE-AWAY- Multiple Blessings Virtural Grand-Opening! 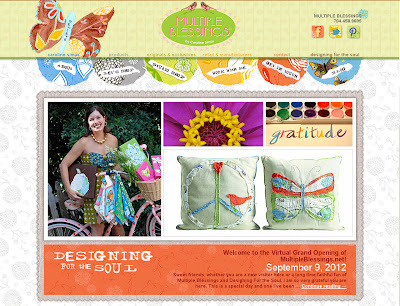 I cannot tell you how THRILLED I am to be part of Multiple Blessing’s Virtual grand opening! Multiple Blessings by Caroline Simas is a licensed brand known for inspirational art and faith-based messages. Multiple Blessings' designs can be found on a variety of home décor, textiles, giftware and much more which are available for purchase worldwide. As a licensed artist and mother of four, Caroline enjoys designing from her home studio in Charlotte, NC. She gathers inspiration from her faith and her family who provide love, support and much of the color and character for her creations. I have donated a set of placemats for one lucky winner. The winner will be able to select the design of their choice. You can see the design choices on my website here. Please visit Caroline's blog here to enter. (Please do not enter on my blog). Drawings will be done from her website! Caroline is truly a design powerhouse! I have been deeply blessed by her designs and inspiring words on her blog. I hope that you will add her to your online reading. I can assure you will be blessed!